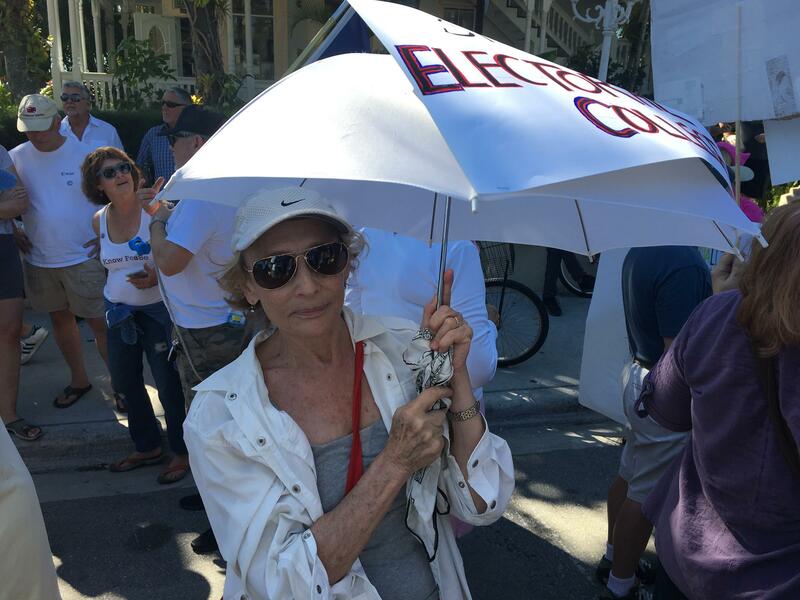 Thousands of people took to Duval Street in Key West Saturday to protest the presidency of Donald Trump. 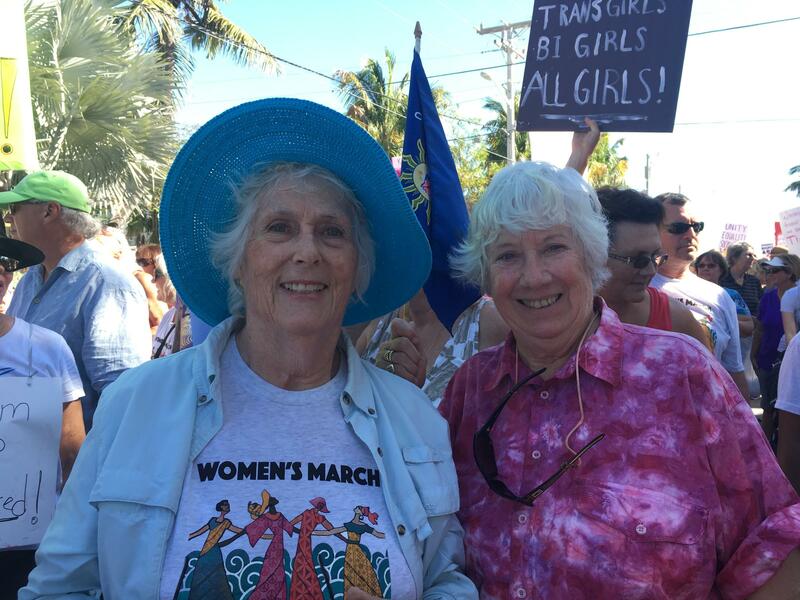 Pat Cummings, Diana Reif and Michelle Moseley talk about why they joined the Women's March on Duval Street in Key West Saturday. 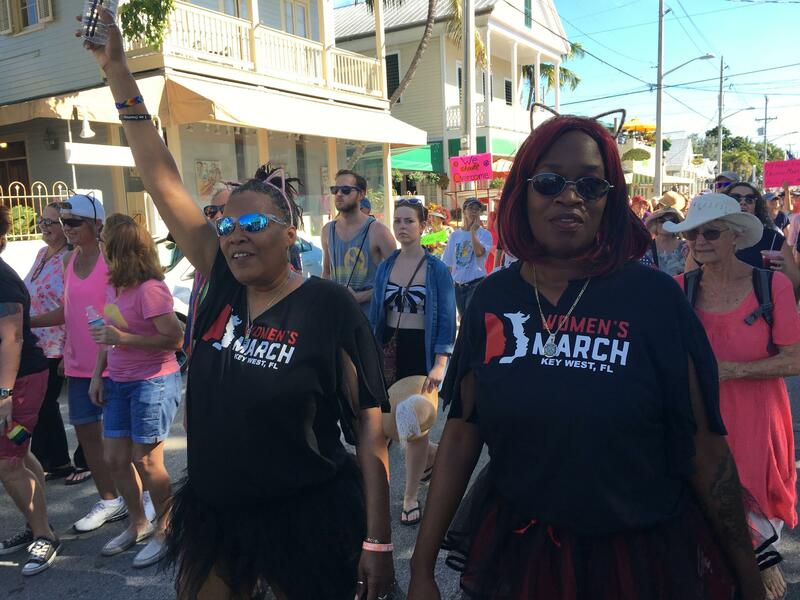 An estimated 3,200 people marched Saturday from the Atlantic Ocean to the Gulf of Mexico in the Women's March on Duval Street, a march in favor of women's rights and equality for all. 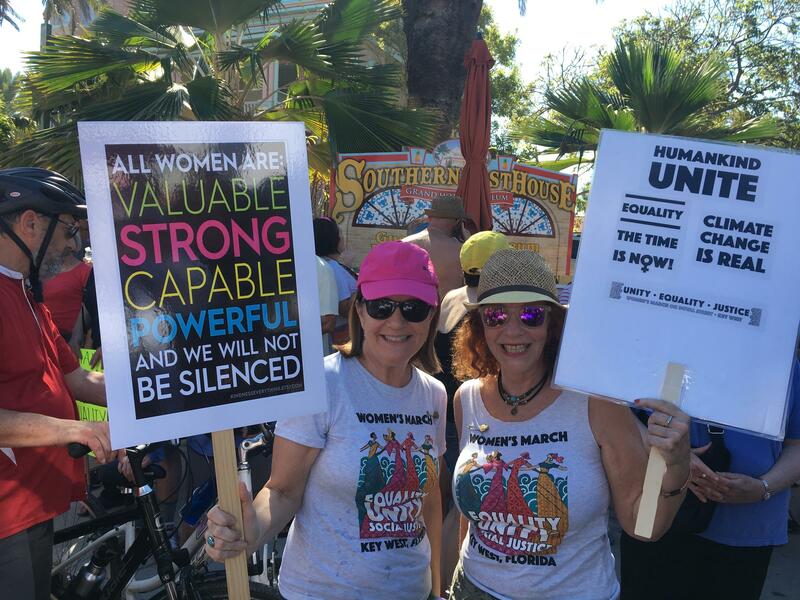 Marchers included wealthy snowbirds and T-shirt shop workers, young and old, women and men, gay and straight. A portion of the world's longest rainbow flag made the march, with two city commissioners among those carrying it. "I believe in equality for all and I think this current President is going to try to turn back the clock for the benefit of the very wealthy, especially white males and especially Protestants or other Christians. And not defend the rights of minorities and especially women. He is the groper in chief. "I protested many years ago in Washington and was pepper-sprayed so I know what it's like. I hope it's peaceful there today. "I think the majority of people who did not want this person president should not be silent and at every corner should stand up for our rights." "I'm marching for women's equality. I'm marching for climate change, to keep our world together and in one healthy place. And I'm also marching to unite mankind. Everyone's equal. All humans deserve respect. "I'm here marching for my daughter, for all women, equality for all religions, races, ethnicities, sexual orientation. It's pretty new. I never expected having to be out here doing this at this point in time in history." 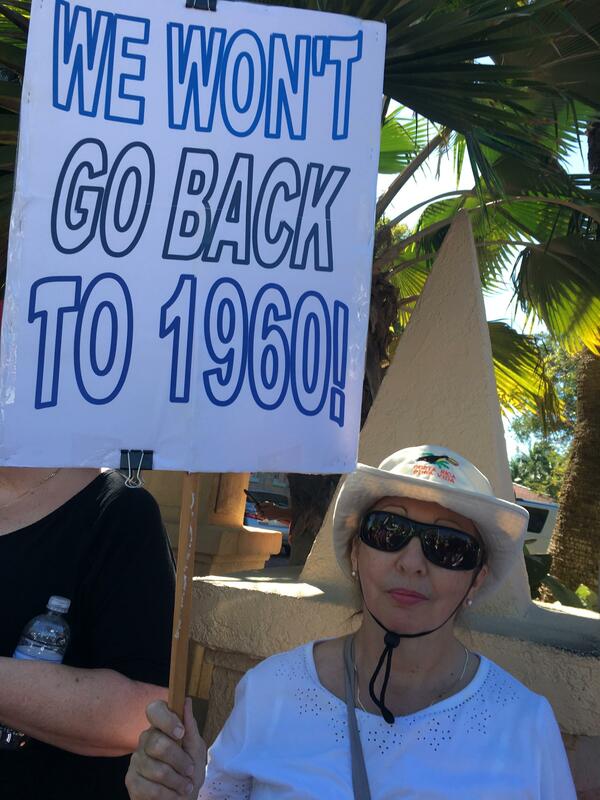 "I marched in '68 in Washington, D.C. and as Michael Moore says, in the years since we've won twice and lost everything. And we can't lose again. We have to win." "I'm for America, I'm for equality, I'm for women's rights, I'm for human rights and I'm for making a difference in two years and in four years. I've waited all my life for things to get better and now some fool comes along and thinks he's going to make it worse. And he's not. We're not going to let it happen. It's important." "I'm here to protest the illegitimate election of Donald Trump. I didn't march a long time ago. I marched against Bush for the first time and I thought it was futile. But I think this presidency has to be protested. I think it's unprecedented. I think it was stolen. My sign says 'Storm the Electoral College.' I don't want people to forget that this was the second election stolen from Americans. The election of 2000 was also ripped from the people by the Electoral College." "I don't want my rights taken away from me. Whatever I choose to do with my body, I should have that choice." "I don't want to be bullied into being who I'm not. I am who I am. I am a lesbian. And I stand firm on who I am. "My sister and I got together and she was like, 'Michelle, we've got to do the women's march.' And I said, 'I have to be at work at 4 o'clock.' She said, 'You've got time.' I said, 'OK.' When we got here, I was overwhelmed and I'm glad I did it. I'll be 47 this year and I'll be damned if somebody sits up here and tells me what I can do with my body, what I need to with my body. No, this is my body. I was born with this body, not you. You cannot tell me what I should do with my own body and you can't tell me how I should live my life." Michelle Moseley, left, and Andrea Whyms.